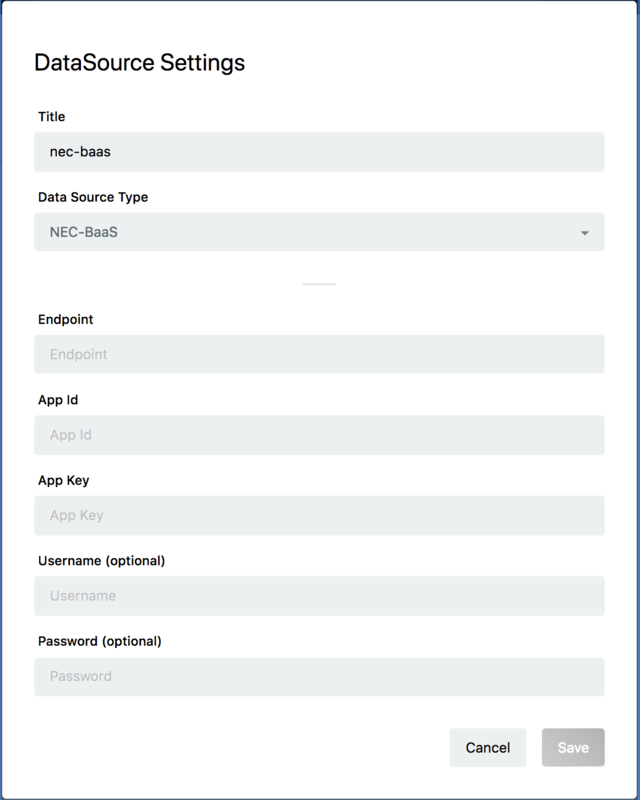 NEC BaaS is an "NEC Mobile Backend Platform". Please see this page for more details. Please refer to this page for InfoMotion support of NEC BaaS. In the same enebular project click Data Source then the plus button to open the Data Source settings. Please enter the name of Data Source. For the API server host name, specify the server host name on which NEC BaaS is operating. Confirm the tenant name (ID) on the NEC BaaS developer console. Specify the object bucket name to refer to the bucket name. Setting of the search condition is optional. You can specify where in the object query based on the same format as the search condition. Please check NEC BaaS documentation for search conditions. Click Save to set the Data Source. You should see a new Data Source created. You are ready to use Data Source. The data can be reflected in the graph by selecting the Data Source created when creating the InfoMotion dashboard. Sample InfoTypes to downoad a graph, Upload an InfoType to upload a graph to enebular, and Create InfoMotion to create an InfoMotion dashboard.